Gardens are romantic, which is why so many people choose to celebrate weddings amid places like backyards, botanic gardens, and the flowerbeds of public parks. Similarly, plant nurseries are romantic. They’re colorful, fragrant, and filled with opportunities to create beauty outside and indoors. Cut flowers are lovely, but they aren’t a gift that keeps on giving. When the petals drop, so do the stems… into the trash or a compost heap. Many people who enjoy receiving flowers prefer the potted kind they can transplant outdoors. In fact, they may ooh and aah about a tray of bedding plants. Some people are more focused on growing edibles than ornamentals. Win kudos (and, in time, some great meals) by helping your favorite new gardener research what grows well in a Southern California vegetable garden and when to plant it. Then, help pay for the seeds and plant packs. If your valentine loves baking pies or making jams, a rhubarb plant (aka the “pie plant”) is a must-have garden resident that traveled here from Europe. Philadelphia’s famed colonial plantsman John Bartram is credited with being the first to cultivate the deliciously tart Rheum rhabarbarum in the New World. By the way, if we are out of rhubarb or another plant you want at the Green Thumb Nursery garden center you visit, we’ll be glad to check availability at our other stores. Without something to twine up, vining plants are a sprawling mess. You might say the same thing about love. It needs to be trained up and supported. Trellises come in many styles — including arbors and obelisks — as well as varying sizes for vining vegetables as well as fragrant ornamentals. Although roses don’t truly vine, the canes of climbers thrive when gently tied to the lattice of trellises. Gardening can be hard on hands. Sturdy, water-resistant garden gloves and soothing lotions give the gift of protection. Imagine a shallow bowl — the earthy terra cotta kind or one with an intense red or orange glaze — filled with lots of plump, drought-resistant succulents. Create a quilt of rosette-shaped hens and chicks (sempervivums and echeverias) in many shades of green tinged with pink and purple. The characteristic you might not expect from delicate looking orchids is that many are tough survivors as long as you mist them with water or let them hang out in the bathroom during showers. Phalaenopsis types, which are particularly expert at tolerating dry indoor environments, come in many color combinations as well as solids. Is your valentine a wildlife gardener who loves to take care of songbirds? 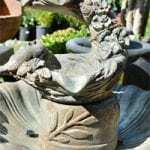 A birdbath adds graceful good looks along with kindness to a garden. Practical gifts can be pretty. Plus, not all people like frilly, frou-frou demonstrations of affection. A new gardener may especially appreciate some shiny new hand tools, including a trowel, tied together with a big, red bow. Or you could select nesting together a few colorful pots, tuck in some packets of flower seeds, and — once again — bedeck them with ribbon. Sorry, but we’re not getting X-rated here. We’re talking about acts of passion and materials that get your hands dirty. 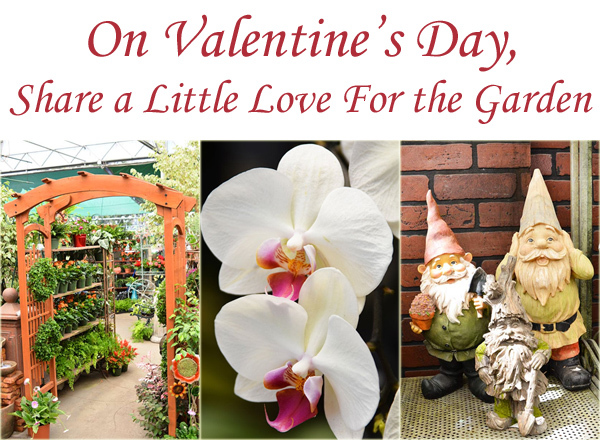 Make your valentine feel loved by helping dig into a garden project. You’ll find compost, fertilizer, mulch, top soil, and a broad array of soil amendments at Green Thumb Nursery garden centers. Nothin’ says lovin’ like helping with the heavy lifting of building a raised bed, laying cobblestones for a dry creek bed, or putting in an herb garden. Put aside your prejudices about bobble-head flamingos, statues of mermaids and bunnies, and stone gargoyles. Even if you don’t love yard art, it’s okay to give in and indulge the beloved gardener in your life. Just stop saying no to gnomes and cute ceramic toadstools. Your valentine will be so impressed by your change of heart. You can never go wrong by giving a gift that offers choice and the opportunity to splurge. Whether experienced or a beginner, any gardener is likely to appreciate a gift certificate good for purchases at any of our five Green Thumb Nursery garden centers. Furthermore, each of our centers have trained garden advisors on staff to answer questions about plants, gardening materials, and growing techniques. Come in for a visit or contact us with any questions you may have. Along with the rest of our friendly staff, our advisors will help you find what you need for a happy Valentine’s Day.